Getting yourself out of debt requires a solid plan. Get pointers on how you can reduce your credit card or student loan debt and start saving. I'm not proud of it. But there was a time when I seriously considered tossing my credit card into a dark corner of my freezer, letting it harden into an impenetrable block of ice. I was a year out of college with a newfound salary, and in denial that I couldn't go out to dinner and drinks every night and not pay the consequences. Even more daunting than thinking about paying off the credit card was the thought of my empty bank account. How was I supposed to start saving when I was in such a financial hole? Thankfully, before my debt turned into disaster, I got a grip and slowly started digging my way out. Whether it's credit card debt, student loans, car payments, or mortgages, most people deal with debt at some point in their lives. It can be a dangerous thing—and if neglected can quickly spiral out of control. Here’s the good news: The Fidelity Viewpoints® article "How to pay off debt—and save too" has six steps you can take to get a handle on your debt—and start saving at the same time. Beats the freezer burn, if you ask me. It might seem counterintuitive, but before you even think about tackling any debt, make sure you have some money socked away to cover necessary living expenses in case of an emergency. You never know when your car’s brakes are going to break or your basement’s going to flood, or you have some other unexpected expense that throws a wrench into things financially. How much to set aside for an emergency depends on your situation. In general, saving for 3 to 6 months of expenses is a good starting point. You can even set up automatic payments from your checking account to another account to start saving regularly. 2. Contribute up to the match on your 401(k). Many employers offer a match on your 401(k) or 403(b), meaning, they'll match the amount you contribute—often 50 cents for every dollar—up to a certain percentage. It’s like getting "free money," and you wouldn’t pass that up, right? Since retirement could be a long way down the road, you may want to consider investing in equities that may be available in your plan to give your cash a chance to grow. On a related note: Your employer also may offer another type of tax-advantaged account, called a Health Savings Account, which can be a great way to save for short- and long-term qualified medical expenses. Read on to find out why you might want to take advantage. 3. 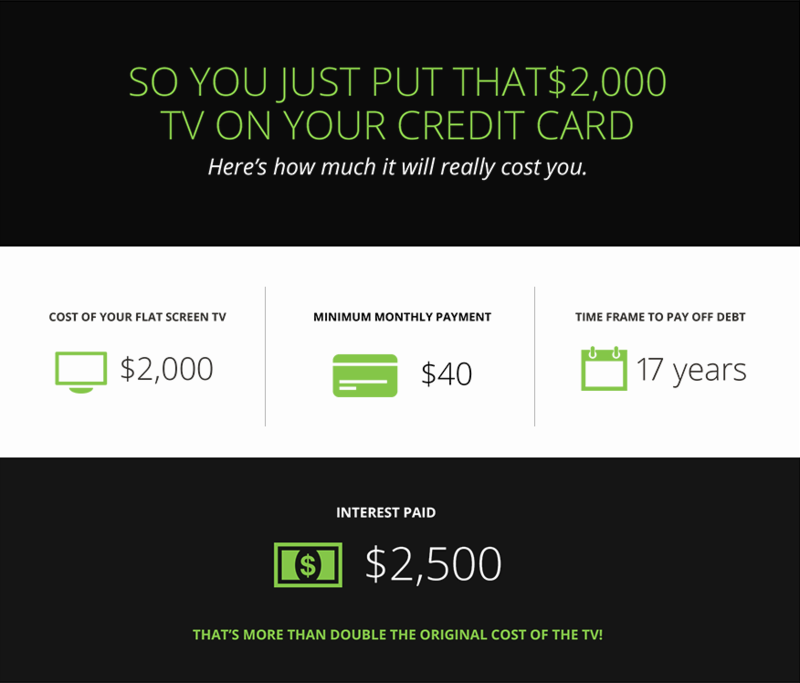 Pay off high-interest credit cards. As I already admitted, it can be easy to run up a high credit card balance. And take it from me: Making only the minimum payment on your balance while paying high interest rates can be a recipe for financial disaster. Do yourself a favor and pay off more than the monthly minimum if you can, and save yourself the stress—and the interest—later. The hypothetical example below paints a helpful picture. For illustrative purposes only. Source: Bankrate, Inc.
4. Pay off private student loans. If you graduated with a degree and a boatload of student loans, tackle the private ones first. They have higher interest rates than government-issued loans (5% to 12% versus 4.45% for government undergraduate student loans,* according to FinAid). In some cases, you may be able to deduct the interest on a student loan when paying taxes—but only up to $2,500 a year, and only if you are a single filer earning less than $80,000, or $165,000 for married filing jointly. . In general, it can be a good idea to pay down student debt above 8% interest, especially if that debt is not tax deductible. 5. Contribute even more to your 401(k). I know what you're thinking: "Why would I put more away for retirement when I haven't finished paying down my debt?" Truth is, things like government student loans, car loans, and mortgages tend to have low interest rates. So it can actually be more beneficial to bump up your 401(k) contributions to start saving for the long term, while making minimum payments on your other loans. 6. Tackle lower interest loans last. Government-issued loans, car payments, and mortgage payments come last of all, because they tend to have lower interest rates (usually 4.5% and below). As previously discussed, government-issued student loans can even come with tax advantages, so paying only the minimum monthly payment on these types of loans—while you focus on other financial priorities listed above—may make the most sense. Keep in mind that college grads can have different types of debt, which can come with various interest rates. For more guidelines on paying them down, take a look at the original Fidelity Viewpoints® article. Who knew you could tackle debt and start saving at the same time? I wish I did. Follow the simple steps above, and not only will your 401(k) thank you, but you’ll be well on your way to ditching more of that debt for good. Looking for the most efficient way to pay off your debt? Having a debt management plan may be what you need to start gaining financial freedom. 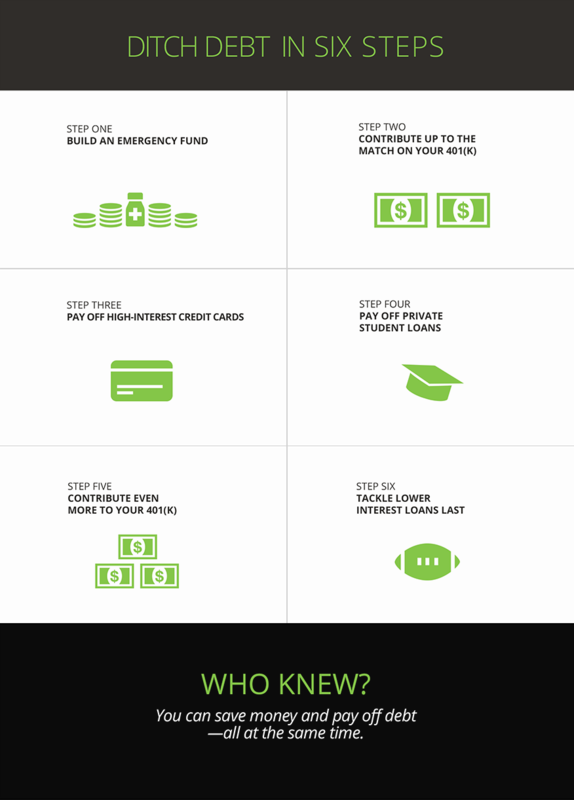 Follow this 21-point game plan and you can be on track to pay off your student loans faster.